Myra McEntire: THE VESPERTINE Is Out! I was lucky enough to do a cold read for Saundra Mitchell for THE VESPERTINE last fall. I read it in two hours while my children destroyed my house around me. I can honestly say I didn't look up. When I finished, I went out on my front porch and stared down at the mulch in my flower bed, torn between wanting to hang the whole writing thing up because I'd never be that good, and running inside to start writing something, anything, because I was so inspired. Much like she did with SHADOWED SUMMER, Saundra found a way to steep THE VESPERTINE in a setting so real you'd swear she'd lived in it her whole life. Unless she's a vampire (and I've seen her in sunlight, no sparkle is visible), Saundra wasn't alive in the time period THE VESPERTINE takes place. She still tells a story with the least amount of words possible, making every single one count. It's sparse but rich at the same time. I don't know how she does this. I wish I knew how she does this! You can read the description of the story here, and go ahead and click order while you're at it. If you enjoy historicals and antiquated cultures, you'll love THE VESPERTINE. If you enjoy epic, sweeping, bittersweet love stories, you'll love THE VESPERTINE. I know for a fact - because I emailed the second I figured it out - that one of the characters in THE VESPERTINE is kinda based on one Mister Chuck Bass I Mean Ed Westwick. So to celebrate the release of THE VESPERTINE, I will include this picture. And then I will promptly take it down, because I'll start getting nothing but Ed Westwick hits on the blog. I am excited for this release. Saundra is a brilliant author. She captivated me with SSummer, so know The Verspertine will be great. I love it!!! One of my favorite books from this year!! I'll definitely have to check this out. 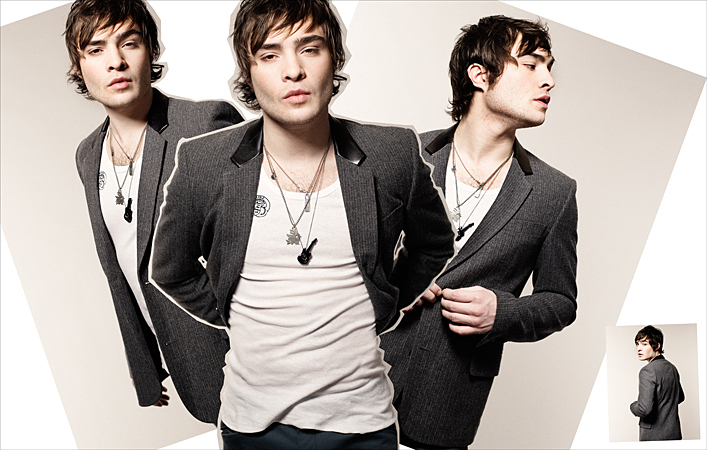 Also, Ed Westwick = hot. what can I say? this post is YUMMY! But THE VESPERTINE was even yummier. Loved it - so glad you're helping to spread the word! This is the 2nd time I've heard this book mentioned today - the other blogger loved it too! It's on my wishlist now! Well I'll be putting The Vespertine on my wish list, it sounds like a story you can't pass up. I knew it! While I was reading VESPERTINE I thought "wasn't Saundra going on about Ed Westwick a while back, and doesn't this description of Nathaniel seem very familiar?"